You can also use modulus (%) to calculate the remainder. A bit (Binary digIT) is the basic unit of information stored in the computing system that exists in two possible states, represented as ON or OFF. In computer system, the ON state considered as 1 and OFF state considered as 0.
e.g. $a & $b – Bits that are set in both $a and $b. This is because both values share the bit in third position on place value 4. $a | $b	Or (inclusive or)	Bits that are set in either $a or $b are set. $a ^ $b	Xor (exclusive or)	Bits that are set in $a or $b but not both are set. ~ $a	Not	Bits that are set in $a are not set, and vice versa. Returns true when set bit of one expression is not set in another expression. If a and b are two numbers, BIT SHIFTING shifts a bits b number of steps. each step refers to multiply by two if it is BIT SHIFT LEFT. If it is BIT SHIFT RIGHT, then each step refers to division by two. The symbol for assignment is “=”. This “sets” the left operand to the value on the right. It does not mean “is equal to” as the symbol suggests. –$a – Pre-decrement – Decrements $a by one, then returns $a. $a– – Post-decrement – Returns $a, then decrements $a by one. 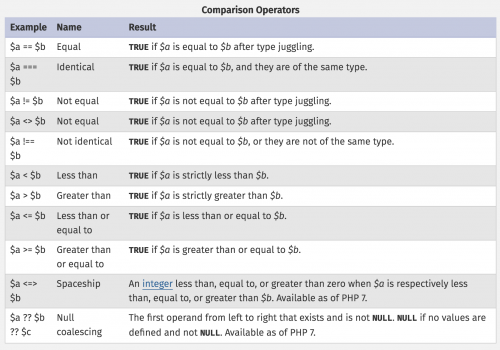 The null coalescing operator has been added in PHP 7 as syntactic sugar for the common case of needing to use a ternary in conjunction with isset(). There are two string operators. The concatenation operator (‘.’), which returns the concatenation of its right and left arguments. The second is the concatenating assignment operator (‘.=’), which appends the argument on the right side to the argument on the left side. $a + $b	Union	Union of $a and $b. $a == $b	Equality	TRUE if $a and $b have the same key/value pairs. $a === $b	Identity	TRUE if $a and $b have the same key/value pairs in the same order and of the same types. Backticks (“) is the one execution operator that PHP supports. PHP will attempt to execute the contents of the backticks as a shell command. Use of the backtick operator is identical to shell_exec(). Note: This article is based on PHP 5.5.